Thousands of people wearing pink will gather on the state capitol grounds Saturday morning. The Komen Race for the Cure event will raise thousands of dollars for breast health education and breast cancer research. Race co-director Giulia Jackson of Runnells says it’s the biggest annual fundraiser in the state. 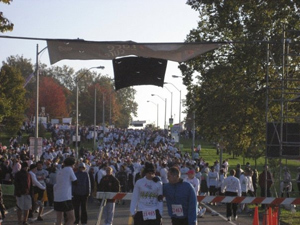 The race is expected to draw over 25,000 participants. The day’s events include a 5K run/walk starting at 9 a.m. and a one mile walk beginning at 9:30. Some participants travel several hundred miles to take part. “We have people from all over the state,” Jackson said. “We really, over the past few years, have kind of thought that we would reach a cap on the number of race participants we can get based on our population. But, every year, we’re just amazed at how much the race grows.” More information about the Des Moines Race for the Cure can be found online at www.komendesmoines.org.